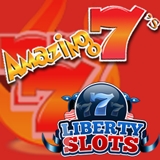 Liberty Slots has just launched a sizzling hot new slot game, Amazing 7s. This one is a classic slot machine with traditional symbols that like Bars, Bells and of course Sevens. Bet as little as a penny per line, or up to $5 per line for a max bet of $125 per spin. Five Triple 7 symbols pays 10,000x. From now until the end of June you can try the new game for free. Enter coupon code FREESEVENS at the cashier and $5 will be instantly added to your player account. Amazing 7s is an “option buy” slot game. There’s no Spin button, instead there are Single Credit, Double Credit and Triple Credit buttons as well as a Play Max button. Players set the bet value for a “Single Credit” and can then double or triple that bet whenever they like just by clicking those buttons. You'll earn comp points when they play any of this deluxe online casino’s hundreds of games from Wager Gaming Technology. This month, everyone playing Gold of the Gods, the Game of the Month, will earn double comp points.